Danthonia compressa inflorescence. By Arthur Haines. Copyright © 2018. New England Wild Flower Society. gobotany.newenglandwild.org (Accessed 2/2018). 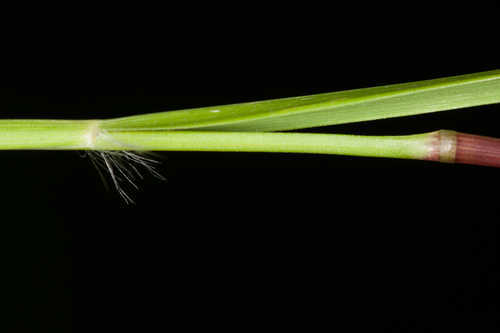 Danthonia compressa stem and ligule. Copyright� 2006 John R. Gwaltney. Southeastern Flora. southeasternflora.net (Accessed 2/2018). Danthonia compressa is a perennial (probably a C3 grass see Waller and Lewis 1979) , fine, tufted; stems slender, some nodes flattened, 40-80 cm, sheaths glabrous. 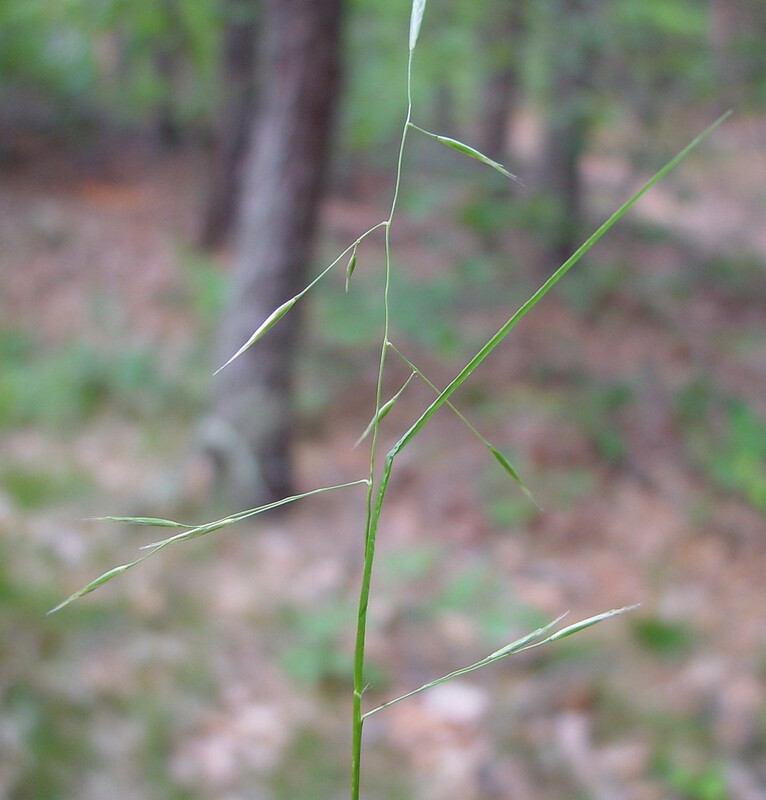 Leaves with blades to 20 cm long, 0.2-0.4 cm wide (about half the length of the flowering stem). 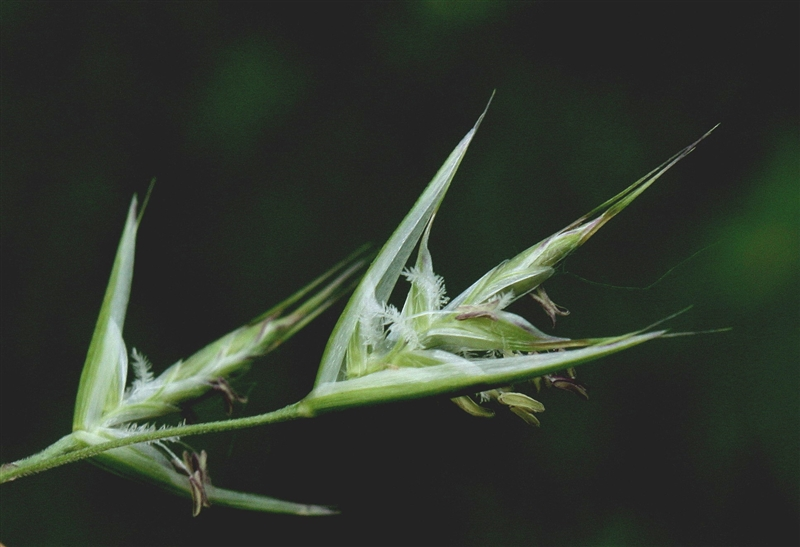 Danthonia compressa open spikelets. R. W. Smith. University of Michigan Herbarium. mchiganflora.net (Accessed 2/2018). Flower spikelets 2-3 per branch, glumes 0.9-1.3 cm, lemmas with long, usually twisted awn arising between whisker-like teeth, 0.2-0.4 cm long at apex, several florets; inflorescence sparse, lax, 5-10 cm, branches, stalks of lower branches longer than the spikelets, often bent back when blooming; June-Aug.
Habitat: Moist to dry open woods, tolerant of shade, fire, intolerant of salt, soil pH 4.8-7 (USDA, NRCS 2010). Less tolerant of drought and poor soil than D. spicata (see below). Notes: Often infected with an endophytic fungus, Atkinsonella hypoxylon (Clavicipitaceae, Ascomycetes), (Clay and Leuchtmann 1989).